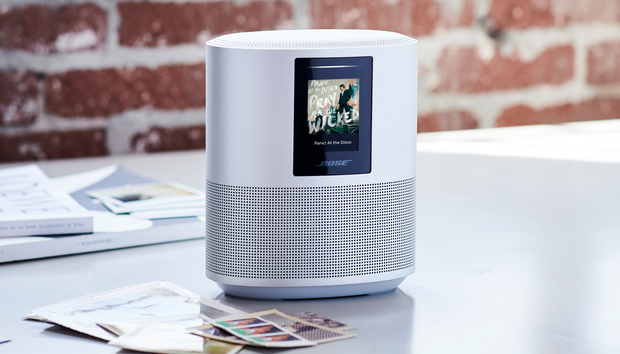 Bose is masterful at building compact speakers that deliver performances out of proportion to their size, but it’s been viewed as having been outmaneuvered by competitors such as Sonos when it comes to building smart speakers that respond to voice commands. The brand-new Bose Home Speaker 500 should change that perception, but not all Bose fans will be pleased with the path the company has taken to get there. While Bose is building on the five-year heritage of its SoundTouch series of self-powered speakers and soundbars—some of which can be controlled with voice commands made to Amazon Alexa devices—the new Bose Music app that controls the $400 Home Speaker 500 (and its companion soundbars, the $550 Soundbar 500 and $800 Soundbar 700) rely on different platform. If you already have SoundTouch speakers and want to add one of Bose’s new smart speakers to another room, you won’t be able to control all of them with the same app, let alone get all of them to play the same music in perfect sync. Some consolation: You can at least use voice commands to have Bose’s smart speakers trigger separate SoundTouch (or other Alexa-compatible speaker) operations from afar. 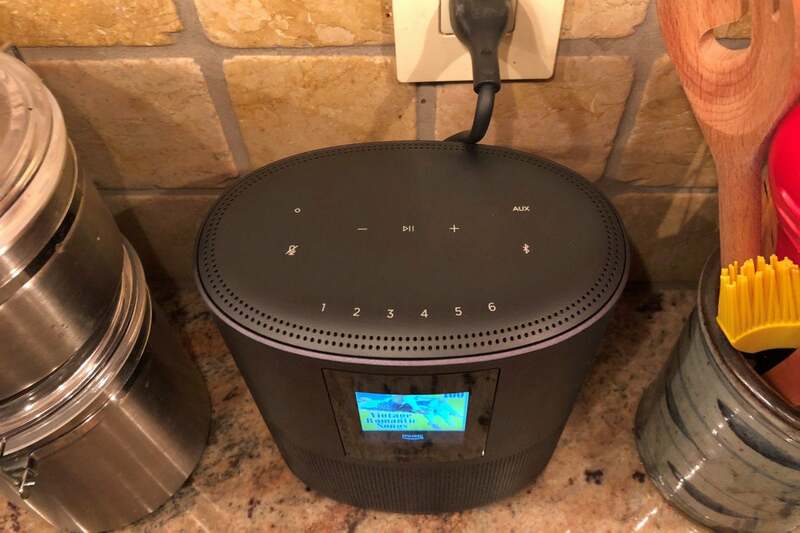 But the compatibility issue is one that Sonos has thoughtfully avoided: Not every Sonos speaker recognizes voice commands, but any Sonos component the company has every brought to market remains interoperable with everything else in the company’s stable. The Bose Home Speaker 500 produces high-quality, room-filling sound from a small footprint. Folks who don’t already own Bose speakers, of course, won’t care about that issue. Plus, the Home Speaker 500 has a feature not present on anything in the current Sonos lineup: A 1.75-inch-wide x 2.25-inch-high display for showing album art, track information, and internet radio station logos. True stereo fans, meanwhile, will appreciate that Bose’s speaker delivers genuine left and right channels without requiring you to buy two speakers that you must then configure as a stereo pair. The Bose Home Speaker 500 houses a pair of 2.5-inch full-range drivers that fire out the left and right sides of the cabinet. This builds on acoustic design principles espoused by Bose’s founder, the late Amar Bose: Having the sound emerge from the sides of the speaker, instead of the front, means that the listener hears sound reflected by the room’s surfaces as well as directly from the drivers, enhancing the perception of stereo separation. When done right, as it is here, using full-range drivers instead of separate woofers and tweeters, tends to deliver a more coherent and seamless sound portrait that’s free of what you might call “personality quirks” (i.e., frequency bumps and dips) that can color a two- or three-way speaker’s performance. The drivers and their placement aren’t solely responsible for the Home Speaker 500’s performance. Bose brings digital signal processing to bear, and there’s a bass reflex port (Bose calls it a QuietPort) to increase low-frequency response. All of this is housed in an 8-inch-high, 6-inch-wide, 4-inch-deep chassis wrapped in seamless anodized aluminum. When your phone’s not in reach, touch-sensitive buttons on top of the enclosure allow you to play/pause music and adjust the volume. Six other buttons provide one-touch access to your favorite streaming services or internet radio stations. Touch-sensitive buttons on top of the speaker provide ready access to volume control, play/pause, mic mute, input selection, and Bluetooth pairing. You can also store up to six presets for quick access to your favorite tunes. An eight-microphone array performed extremely well in both near- and far-field situations. In my tests, the speaker could hear me summon Alexa from 25 feet. Even when I had the Home Speaker 500 blasting synth-pop darlings Christine and the Queens (at a level of 70 out 100), I had to get no closer than 10 feet for it to hear me without bellowing. Trying this with a Sonos One speaker playing the same tune at the same level, I had to hover within a couple feet of the speaker and shout to be recognized. Efficient design splits this app screen to offer source options (bannered across the top), content categories, the selected speaker, and the current track. The new Bose Music app, available for Android and iOS, features a spin-the-banner user interface that connects you to Amazon Music, Spotify, Deezer, Pandora, TuneIn Radio, SiriusXM, and iHeart Radio. The Home Speaker 500 and its companion soundbars support a broad range of audio codecs, including Apple Lossless (ALAC), FLAC, MP3, AAC, HEAAC, Vorbis (the Spotify choice), and WMA. You can stream music to the speaker using Bluetooth and Wi-Fi today, and Bose says it will add AirPlay 2 compatibility in 2019. You can connect analog audio sources using the speaker’s 3.5mm aux input. The company also plans to support more digital assistants, starting with Google Assistant, down the road. As happens often with newly launched networked speakers, we’ve experienced a few performance quirks. Mostly connection issues (up through the cloud and back) that stall operations for a second and/or trigger an on-screen alert. Bugs they’ll squash. This speaker really got a groove on with pristine recordings like neo-soul singer Jose James’ sublime new take on the Bill Withers catalog (Lean on Me), and the latest from jazz bassist Christian McBride (New Jawn). While not as bright sounding as a Sonos One, nor as bass boomin’ as an Apple HomePod or Google Home Max, the no-showboating factor is a subtle plus. You forget you’re listening to a speaker. The music just breathes and lives. With a little care taken in speaker placement—giving the Home Speaker 500 some elbow room on a shelf shared with books, or locating it near at least one side wall—the direct/reflecting principle renewed the stereophonic thrills of test perennials such as Pink Floyd’s “Money” and Queen’s “We Will Rock You” (in remastered form on the Bohemian Rhapsody biopic soundtrack). The new Bose app isn't compatible with the older Bose SoundTouch series of speakers, but buyers will be able to set up multi-room configurations with the new Bose Soundbar 700 (shown here) and Bose Soundbar 500. There’s less overt stereo bounce, but still a goodly sense of an expanded sound field, when the HS500 is plopped on a wide-open counter. I can imagine lots of buyers rationalizing its’ four-Benjamins price tag because a Home Speaker 500 eliminates the cost—and clutter—associated with pairing two streaming speakers to produce stereo. 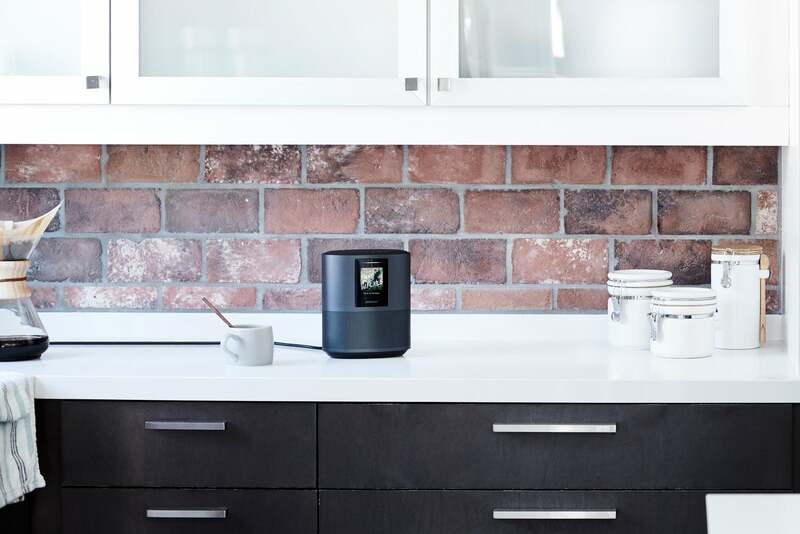 The Bose Home Speaker 500 marks a strong strategic move into the smart speaker market. The high-end sound, generous feature set, and sleek design make it a great fit for nooks and nightstands. How well the platform juggles compatible speakers in a multi-room environment remains to be heard. 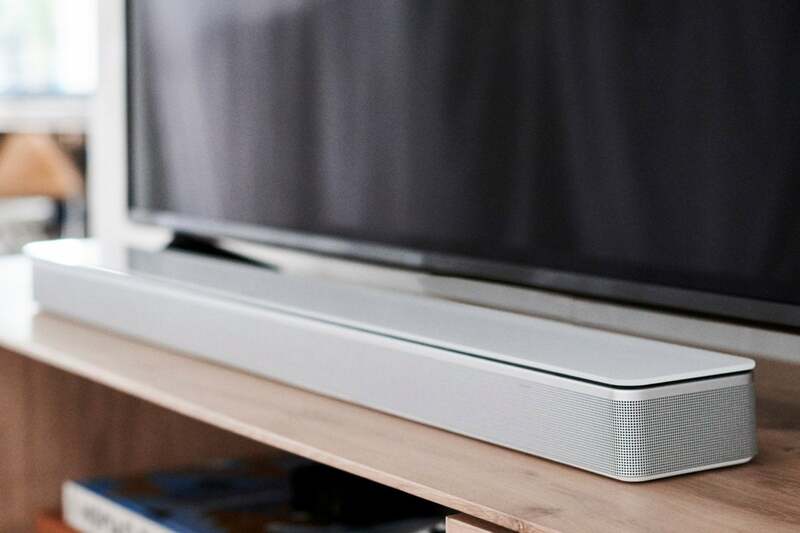 We’ll know better when Bose sends along one of the new soundbars for testing.